3. 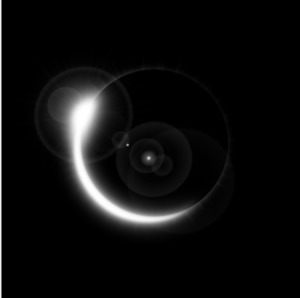 Every eclipse in a series is interrelated and starts a set of related events, creating a total picture in the end. As soon as the family eclipse raises certain question, each further eclipse in a row will continue surfacing this question, giving more insight on it and in the end of a series resolving it or bringing it to the finishing point. By the time a series ends, you will find yourself changed as well. As you understand, it is complicated to cope with huge amount of changes and information at once, so the universe introduces changes in portions with each eclipse. All these changes will be related to the same subject from the start. The development of an issue and its conclusion usually come in a timeframe of 1 ½ or 2 years. However, keep in mind that only those eclipses that coincide with planets in your natal chart in degree will have an influence on you, otherwise it will slightly or not affect you at all. It is the reason everyone needs a natal chart. 4. Eclipses will surprise you with an extraordinary event or with one you were not expecting to appear. It might be caused by an event that occurred elsewhere, and that you cannot control in any way, but during this period you need to expect lots of changes. Let’s look at the example, so you get the idea better. For example you are an agent of the popular artist. You are working hard, your work is interesting and you devote your time and efforts to it. You were the one to open a talent in this person in the times when other agents would neglect this artist. You helped the unknown person become really popular and get the name and reputation. The tandem of your work and artists’ talent bring both of you fame. However, another agent approaches to your artist and offers good contract, such contract you wouldn’t be able to get. Another agent wants to get this artist in order to get more stars in future with the reputation that person has. This artist is everything you have, and you were loyal and hard–working and have built up the image this artist has today. The eclipse comes, and you get the email from the artist where you were included into by mistake. The emails are the secret conversations of your artist with this new agent. Before the eclipse you had no clue that these two are negotiating. Now you know it and you will try to persuade the artist not to sign that contract. Frankly speaking, as this is an eclipse and we’ve mentioned above that if something starts to change, there is no turning back, it is hardly possible that the artist will not sign the contract with the other agent. You have more chances if you make an essential effort, when you are stubborn and courageous, and feel empowered enough to stand against the triple power of the eclipse. So it was an example of how external changes that other people go through can affect you. Usually people do not know about the things that happen out of their reach and such changes are shocking and leave no time to think them over. It is a chance for you to change the perspective, rethink your future plan and doubt your current authorities. Probably, you will come up with idea that it was a mistake to let one artist be your main source of income, or you will find yourself wearing pink glasses which made you less competitive. Anyway, you will have to create and work out another plan to find another artist or maybe few of them. But you should act quickly and confidently, as eclipses take time to begin. They need to gather needed power to introduce changes and progress till their end. Unfortunately, it happens and there are lots of things that indirectly influence our life and these influences sometimes are major. During eclipse such changes can happen. Any kind of event may alter your reality and introduce the changes. It can be something small as brief glance at the lighting screen of your partners’ smartphone to recognize there a romantic text from somebody else. So you haven’t even taken the phone and had no intent to look at it, but it happened and you’ve found out the bitter truth that turns the world upside down and demands taking actions about it. During eclipse really important information is provided briefly and unintentionally: you just stumble upon it. The changes that come afterwards are inevitable.